Harley Davidson Forums - When are the aftermarket companies gonna start making stuff for the M8 softies? bezel or even a replacement? I want a solo seat with removable backrest. Waiting patiently for better solo seat options. What’s out there now is ugly, or just isn’t what I need. Last winter, Le Pera told me they’d have a Bare Bones out for the M8 Softails by February ‘18. Hasn’t happened yet. Mustang has a nice one for a good price, I might get one till things catch up. 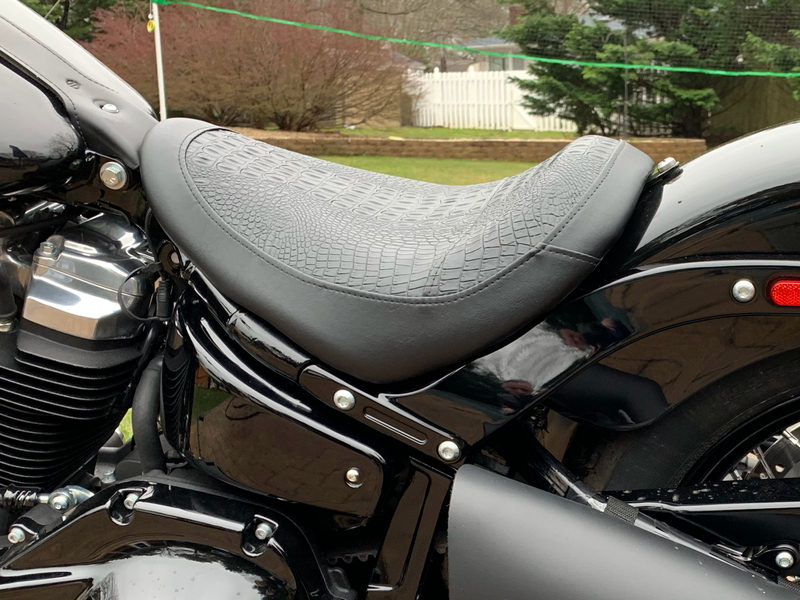 I purchased a second seat and shipped it out to Chris at blackbird customs in Canada. He didn’t have the 2018 saddle to mock-up so I had to ship him mine if I wanted a cover. He was great! He even covered some of my shipping costs. You wouldn’t have to send him your saddle if you are just looking to recover yours. He will make them custom to your design. I’m thinking about shaping the spare saddle and shaving down some of the foam to lower it a bit. Just a heads up as we are making crotch coolers for the New Softail .. I want some soft lowers for winter use. And an eyebrow for my headlight to match my passing lights and turn signals.